Osteoarthritis is known enigma for Orthopedic Surgeons and it continues to be amongst the most important cause of chronic pain and disability. It is estimated that around 6 billion dollars/year are spent alone on management of this epidemic. The purpose of this monograph is to offer the reader treatment options available for the management of osteoarthritis of knee and hip. If one reviews the current spectrum of literature available to, it becomes clear that there is a large body of literature in which the patient has to sort through with varying degree of scientific evidence, making anyone embarking on this Journey a difficult and conducing one. 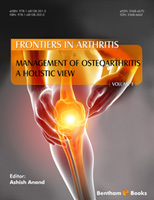 This Monograph provides an in depth analysis of the Pathology, Role of Nutrition and Exercise in treatment of arthritis there by offering a unique perspective to the Reader. The book also provides insights into Role of injectables such as Platelet rich plasma and Viscosupplementation and elaborates on the Role of Amniofix- stem cells from the Amnion and Chorion in the treatment of Osteoarthritis. Finally, the book presents a number of surgical options for the reader that have had an established place for decades in the field of surgical arthritis such as Osteotomy, Arthroscopy and Replacement surgery. Dr Ashish Anand, MD has done a commendable Job in editing the manuscript. This book is a good read for Medical students, residents in training and the busy practitioner. The book contains eight chapters with initial ones focusing on pathology behind osteoarthritis, Role of Nutrition in management of Osteoarthritis and Role of exercise in Management of Osteoarthritis. All of them point and educate the reader/clinician on their important role in pathogenesis as well as prevention of osteoarthritis. The Reader is encouraged to incorporate Nutrition and Exercise management in his Clinical practice. The next chapter tells us about the Role of Viscosupplementation and Platelet Rich Plasma(PRP) in management of osteoarthritis and what the current clinical evidence is for the above two modalities. Chapter 5 is an interesting chapter on Amniofix, which is relatively unheard of. Amniofix is an allograft tissue obtained from a Human baby and contains growth factors which have the potential for treating osteoartrhritis pain when everything has failed and the patient is not interested in surgery. It may even possibly reverse the early damaging changes to the Cartilage. As time goes by, I am sure one will hear a lot about this “Novel” approach. The second last section deals with surgical aspects of treatment of arthritis of knee in which the book dwells on the role of Arthroscopy with Cartilage Surgery, role of Osteotomy around the knee, and Current Concepts in Total Knee Replacement. The last section deals with surgical management of arthritis of Hip-namely Role of Arthroscopy with Cartilage Surgery as well as Current Concepts in Total hip replacement. It is my sincere hope that this book will stimulate the minds of the busy clinicians to read more about the subject and possibly also add some new tools to their armamentarium to give their patients the best possible treatment.